The Little Truckee River in the Northern Sierra Nevada is a popular recreation destination and a source of drinking water for Nevada and California. But for nearly 150 years, the watershed has been divided into a checkerboard pattern between public and private land, a legacy of lands awarded to the railroad as it crossed the mountains. TPL and the Northern Sierra Partnership have been working along the Little Truckee to prevent the development of the most sensitive and important private parcels by bringing them into public ownership. 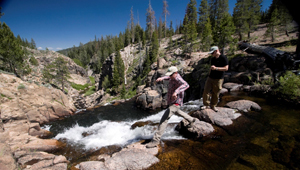 In August 2009, TPL helped to protect 100-foot Webber Lake Falls, which includes three natural swimming holes, for addition to the Tahoe National Forest.